After announcement of benefits for upper division Clarks, there are a number of queries and concerns being raised by several central government employees. The major thing that most of the employee in this grade is concerned is about how they are going to be paid if the grades in various levels of lower division Clarks have been merged with that of the higher division Clarks from Rs. 2400 & 2800. There are still some of the things left unexplained about how the differentiation is going to work when the grades has been merged into a single category. 2 Highest Central Employees Strength According to the statistics, railway has the largest employee’s strength of around 13 Lakhs followed by Ministry of affairs with over 9 Lakh employees. 3 Ratio of Employees under Central Government Civil Post Categories With 3 categories of Group A, B and C. Group C – About 88% of employees works in lower ranks, In Group B – About 9% employees works in middle management position, and in Group A – About 3% employees works in Senior Management position. 4 Suggested Pay hike by 7th CPC Report As per the 7th CPC Report, about 23.55% pay hike recommended for government employees. 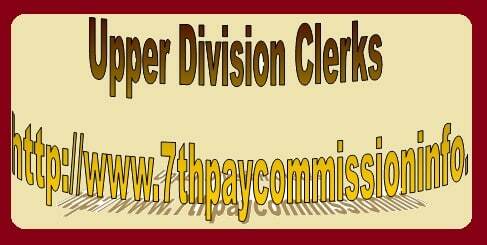 One thing that is very sharply pinpointed in the 7th pay commission for upper division Clarks is the increment and promotion every year. The most important point of demarcation is that needs clarification most of this category employees. It is quite unclear about how employee is going to be scrutinized for further levels and how the segregation will work out. As per the terms and conditions of the grade pay, it is very clear about one point that the pension scheme has been changed to the minimum scheme rather than the way employees are fixing the breakup of salary towards pension. As the minimum criteria has been fixed for upper division clerks about how much they have to contribute towards pension, there is no point for employee to go minimum beyond a point. It is both beneficial and non beneficial as there are some employee who are in necessity to contribute against their will to the minimum level. Terms are not clear about the grades that are coming under this category at some point; the grade pay for both lower division Clarks and upper division Clarks seems to be the same.